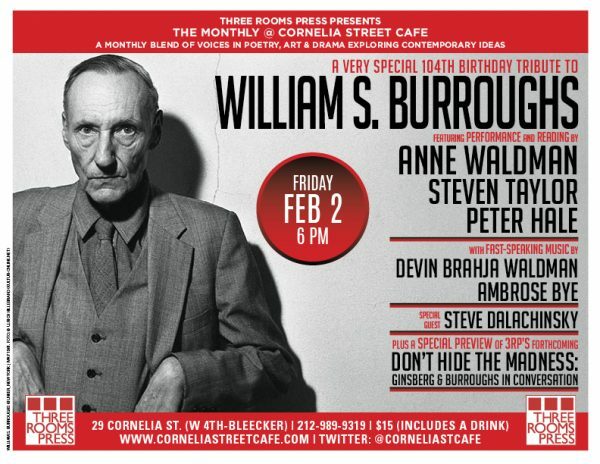 Three Rooms Press presents a birthday tribute to Beat icon and postmodern trailblazer William S. Burroughs, featuring Burroughs associates Anne Waldman and Steven Taylor on Friday, February 2, at Cornelia Street Cafe. The event will be highlighted by work from internationally-acclaimed feminist/activist and performance artist Anne Waldman, author and editor Steven Taylor, with fast-speaking music with Devin Brahja Waldman and Ambrose Bye, Burroughs excerpts by poet Steve Dalachinsky, plus a very special preview of DON’T HIDE THE MADNESS: Burroughs & Ginsberg in Conversation (forthcoming from Three Rooms Press). Three Rooms Press co-directors Peter Carlaftes and Kat Georges host. William S. Burroughs was a Beat Generation writer known for his startling, nontraditional accounts of underground culture, most famously in the book Naked Lunch. Born on February 5, 1914, Burroughs is frequently cited as a major influence on countercultural figures in the world of music, art, and literature. Doors open at 5:45. Admission is $15 which includes a free drink. Cornelia Street Cafe is at 29 Cornelia Street, in the West Village, between W. 4th Street at Bleecker (http://corneliastreecafe.com/).